RIGHT: Getting her priorities mixed up as usual. LEFT: I doubt it’s as bad as all that. What’ve we got here? RIGHT: A series of postcards, fifty-one in all. 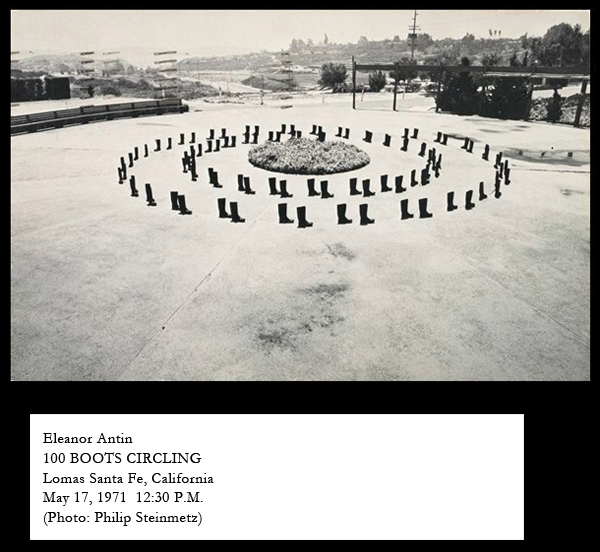 A 1970s project by conceptual and performance artist Eleanor Antin, working with photographer Philip Steinmetz. It’s called 100 Boots. LEFT: Hey, I like it already. PAM: Sorry I’m late! I thought we were meeting at the museum entrance. RIGHT (tapping floor): I was just about to say something important. PAM: Mind if I grab an espresso first from the rooftop terrace? 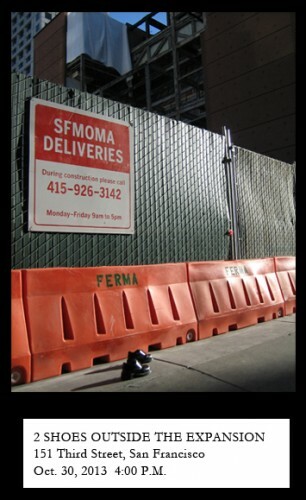 RIGHT (incredulous): The galleries are closed for expansion. 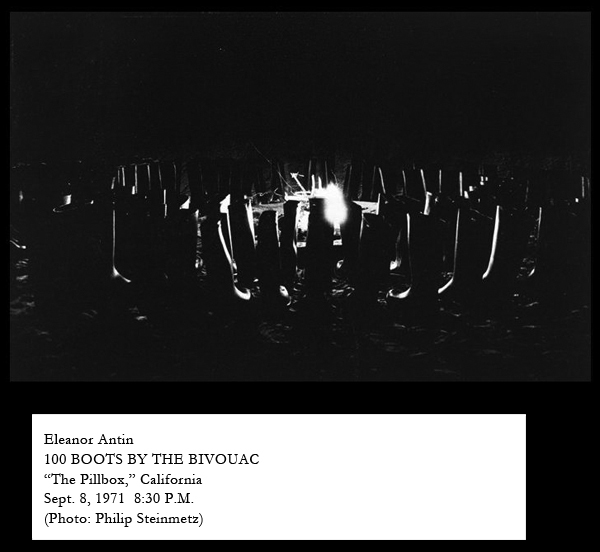 We’ve arranged this visit to the ArtScope vault to help you write your piece on 100 Boots. PAM: Oh, alright. What have I missed? LEFT (with sudden emotion): What joy! What autonomy! Liberated at last from the dictates of humankind! PAM (opens notebook): Go on. 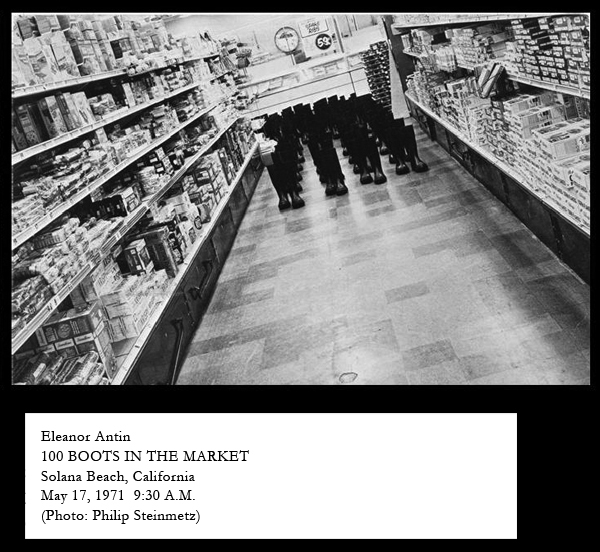 RIGHT: Look at the boots in the market … Isn’t there something too orderly about them, but also too aware? 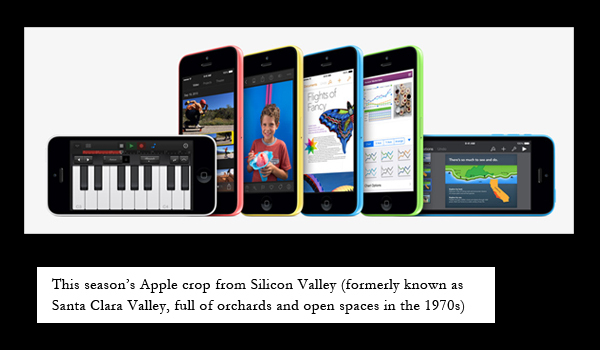 RIGHT (continuing): Through exaggeration, they parody the conformity of everyday shoppers. Industrial manufacturing produces goods that are identical and interchangeable, and humans unconsciously tailor their lifestyles to match. RIGHT: Certainly. Notice here how they clamber over a sedan, in effect advocating walking over driving. And they’re in suburban Southern California, where there’s a car in every driveway and oil fields extend to the ocean. PAM: By staying in touch with the ground, the boots prompt us to slow down and appreciate sights we’d otherwise overlook from a speeding car — like cows in a meadow or ducks in a farmyard. LEFT (pondering): Are the boots in solidarity with animals and open spaces? PAM: I’d like to think so. At least to the extent that the boots, as civilian stand-ins, aren’t also a part of the problem. Many of these fields pictured forty years ago have likely succumbed to housing tracts and high-tech campuses. 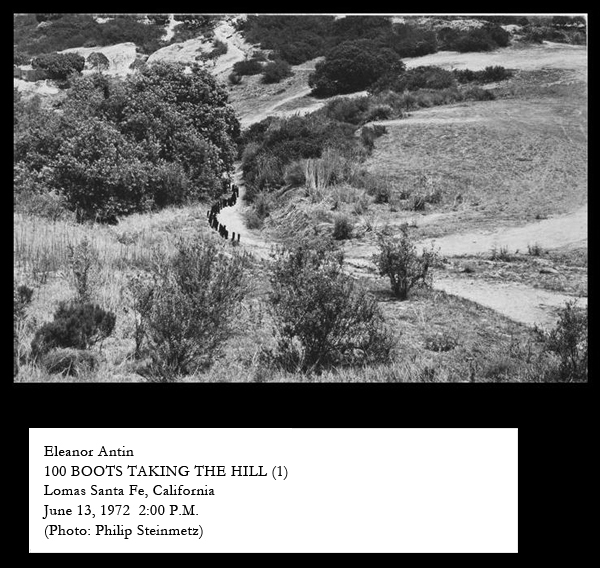 Antin’s postcards serve as time capsules, commemorating a California that signified free living and thinking, as opposed to today’s venture-capitalist playground. LEFT: Wait, are those civilian boots? They look more military to me. RIGHT (ruffled): What are you saying? PAM: It’s true. 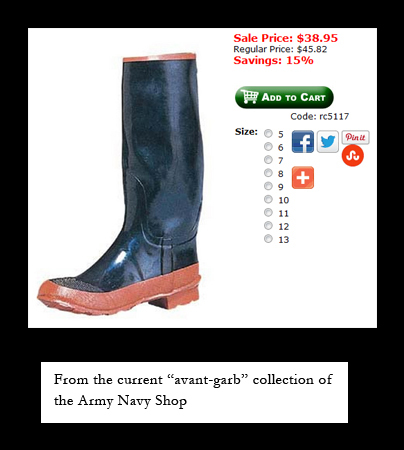 Apparently Antin bought them from an army-navy store. LEFT (excited): This supports my thesis that art is waged like a military campaign. Consider the movements and “isms” of the past century. Many were instigated by rival camps of artists with charismatic leaders, media-ready manifestos, and influential critics. To achieve cultural dominance, you must join a gang. RIGHT: Um, you’re forgetting that Antin has always been an independent artist, never a group member. Through fictional personas, she’s created entire worlds and historical narratives. She’s practically a collective unto herself. LEFT: Exactly! 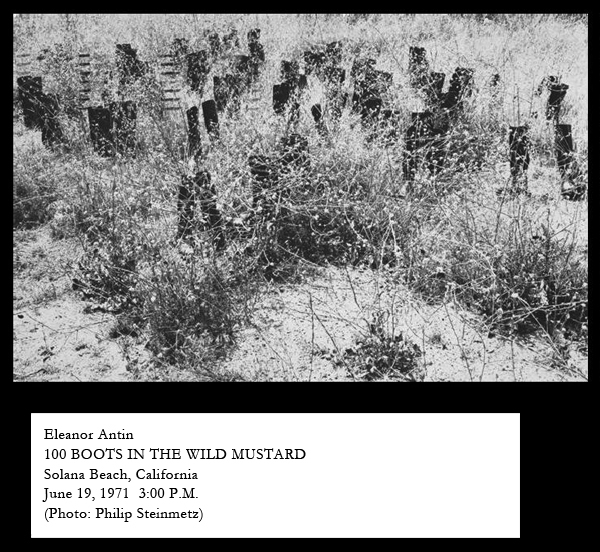 The boots are Antin’s collective alter ego, magnifying her influence to the scale of a movement. 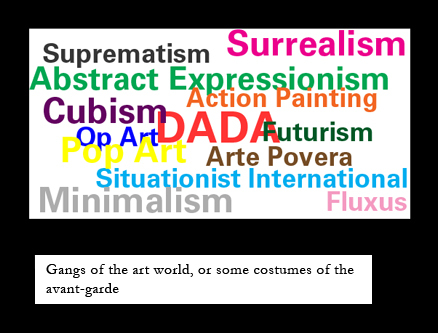 PAM: They’re a mobilized force, wearing the uniform of the avant-garde — hereby dubbed the avant-garb. 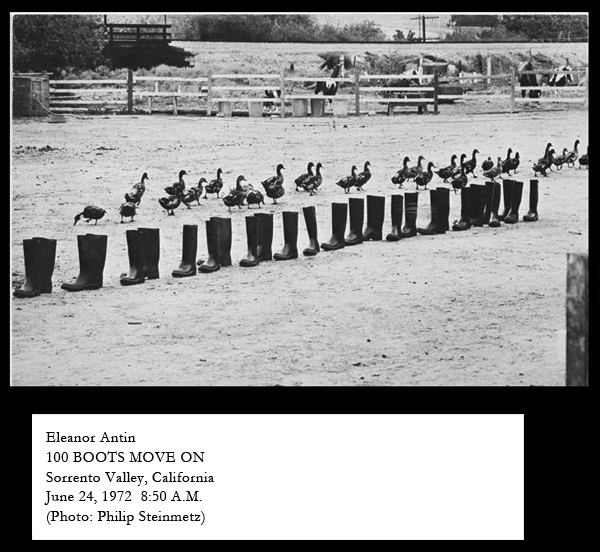 LEFT: And while other artists vie for status, these boots practice stealth maneuvers in the Western chaparral. RIGHT: Hmm, maybe you’re onto something. This could be the dress rehearsal for an institutional takeover. See the later photos? LEFT: Where the boots visit New York? LEFT: Is that the Museum of Modern Art? GUARD: Please don’t touch the artwork. PAM (startled): Huh? Are you here, even during the expansion? LEFT: Are we getting kicked out? PAM: It’s okay. Look, I found this image of the verso online. RIGHT: Ha! 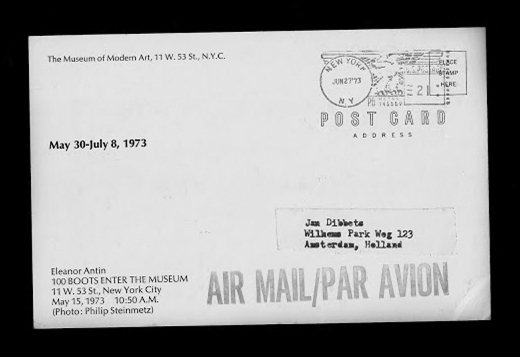 “May 30-July 8, 1973.” So they did get a museum show. This postcard is now both artifact and advertisement. 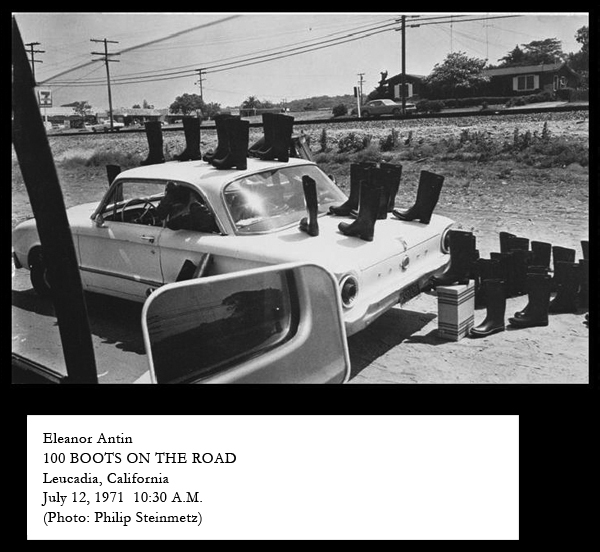 LEFT (studying verso): From mail-art outsiders to MoMA stars … Well, Antin and her boots have surely had the last laugh. PAM: And it’s not just footwear that’s infiltrated the establishment, it’s also ideas. 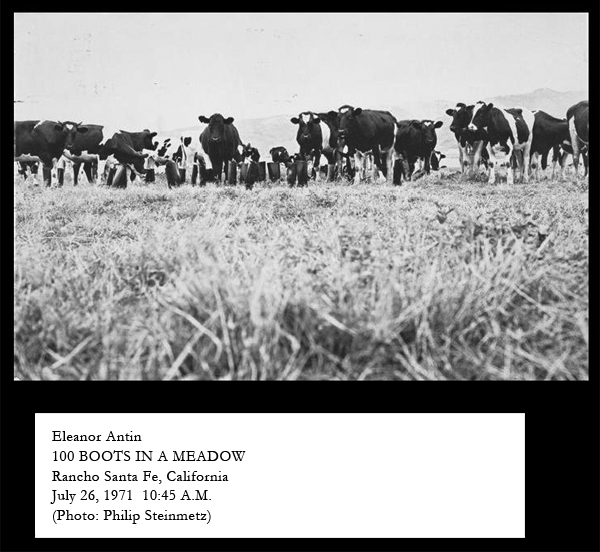 Antin’s project challenges the assumption that technological progress benefits people, animals, and the land, and suggests that entire ways of life can be stamped out by the culture of corporate capitalism. (Closes notebook.) Well, I’ve got what I need to start writing now. How about a drink at the museum café? RIGHT (deadpan): Stella Artois, the French revolutionary’s Bud. LEFT and RIGHT (halt): What? PAM: Café closed for expansion. 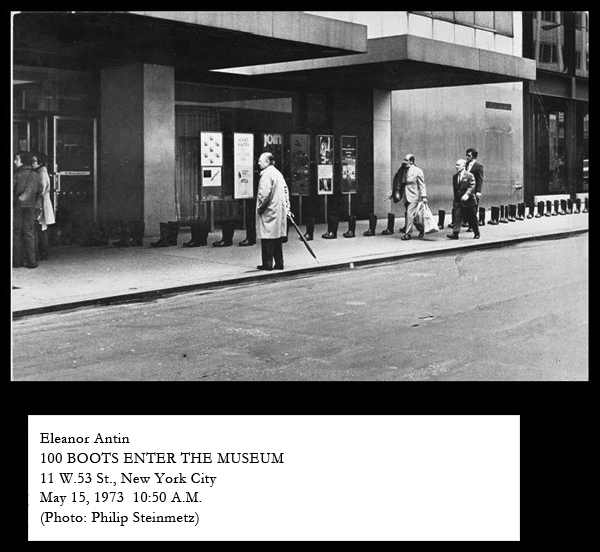 100 Boots postcard images are reproduced from the San Francisco Museum of Modern Art ArtScope viewer. 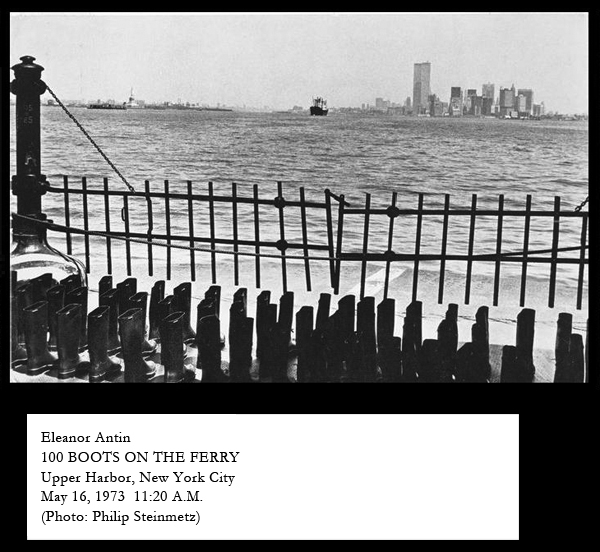 Caption text is transcribed from the postcard versos on exhibition at 100 BOOTS a continuing narrative. 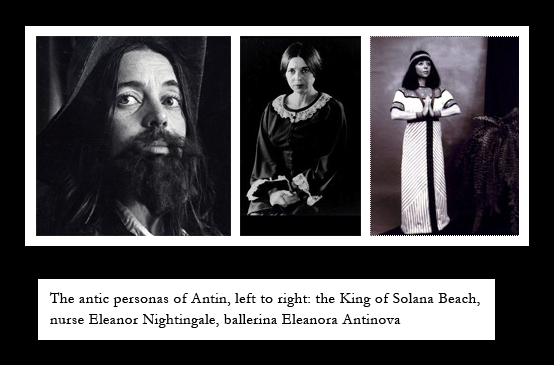 Images of Eleanor Antin’s personas are reproduced from the following sources: King of Solana Beach from the Santa Monica Museum of Art, Eleanor Nightingale from Yowzer! Yowzer!, Eleanora Antinova from Ronald Feldman Fine Arts. 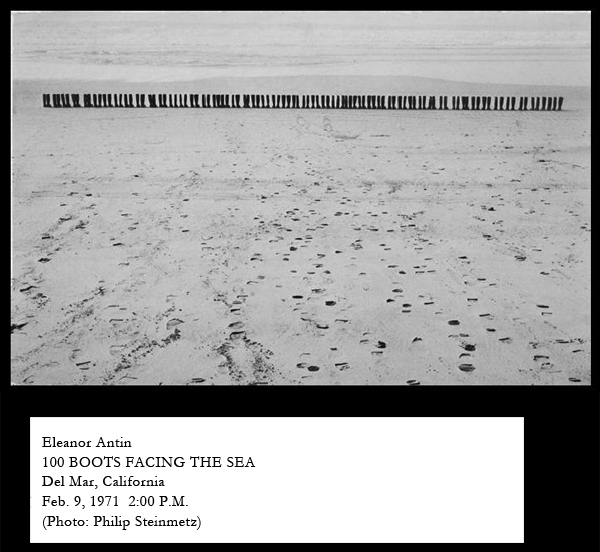 Postcard verso is reproduced from 100 BOOTS a continuing narrative. Pamela Lu is a writer of fiction that explores how people, as individuals or in groups, respond to the comedic yet sobering effects of contemporary systems and institutions. Her books include Ambient Parking Lot (Kenning Editions, 2011), about a band of musicians who make art from the sounds they record in parking lots; and Pamela: A Novel (Atelos, 1998), about young writers coming of age at the paradoxical end of the twentieth century. So happy to hear from you. There is some reason and purpose for all of this. I want to find out what it is for both our growth and more. Read the Peter story but did not find the ending. I wish to know….you. And most everything. Due to the website above. I must go now or I may click the wrong thing by mistake and cause chaos which I never intended to do. For that I am Extremely sorry. I can still look and read but will not respond.